The FDA issued a formal warning letter to Arrow Reliance Inc. doing business as Darwin’s Natural Pet Products, citing pathogen problems at a production plant and saying scientific evidence shows the company’s cleaning solution is ineffective. 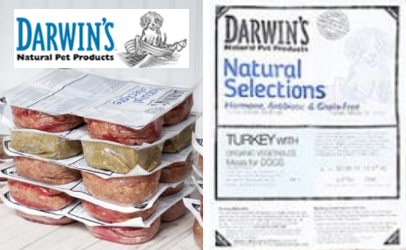 Darwin’s is a manufacturer of raw pet foods and is based in Tukwila, WA. The April 2 warning letter from the Food and Drug Administration cites a history of consumer complaints and product recalls leading to the agency’s analysis of several Darwin’s products. Laboratory tests detected Salmonella, Listeria monocytogenes and E. coli O128 in one or more samples of the pet foods. Foods under FDA jurisdiction, including pet foods, are deemed to be adulterated if they bear or contain a poisonous or deleterious substance that may render them injurious to health, according to the Federal Food, Drug, and Cosmetic Act (the Act). Introduction of an adulterated food into interstate commerce is a prosecutable violation of the Act. Federal officials also found two Darwin’s products were also contaminated with Listeria innocua. Although it is not considered a pathogen in terms of human health, the warning letter underscored that the presence of Listeria innocua is an indicator that Listeria monocytogenes would be capable of surviving and growing in the product. One of the consumer complaints that triggered to the FDA investigation was lodged by the owner of a kitten that died as a result of a “severe systemic Salmonella infection” after being fed Darwin’s Natural Selections Duck Meals for Cats. Salmonella was isolated from the dead kitten’s liver and from an unopened raw pet food package. Whole Genome Sequencing (WGS) analysis, often referred to as genetic fingerprinting, confirmed that the Salmonella recovered from the dead kitten and from the pet food sample were identical. FDA also performed WGS analysis on Salmonella recovered from various other Darwin’s samples. The identical Salmonella strain was found in two different products manufactured two weeks apart and containing two different meat sources. The presence of the identical Salmonella in these two products, according to the warning letter, suggests pathogen contamination in Darwin’s manufacturing facility. In the letter, FDA also expressed its concern regarding Darwin’s use of a bacteriophage product to control pathogens in the raw pet foods, citing a lack of scientifically based validation of the controls and a change in the company’s protocol for applying the bacteriophage to the products. The agency noted that the bacteriophage product is not “generally recognized as safe” (GRAS) nor is it the subject of a regulation describing additives permitted in animal foods. The company was given 15 business days to reply to the warning letter, with a description of the steps taken to correct the violations and prevent these or similar violations from occurring in the future.